Thought this Gillray print was utterly fabulous! 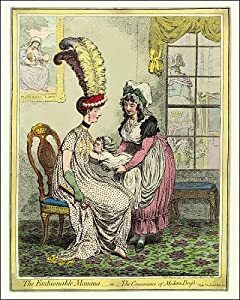 Titled “The Fashionable Mamma – or – The Convenience of Modern Dress”, it shows a late 18th century mother all dolled up in her finery, giving her baby a quick feed before she goes out. I love that the dress has nursing access and feel the need to start a feather headdress revival… fascinators anyone?